Have a high school diploma, GED, or be enrolled in a GED program. The program will accept applicants living in Ingham, Eaton and Clinton counties. Those from underrepresented and non-traditional populations, and those with limited disabilities are encouraged to apply. National Center for Construction Education & Research (NCCER) Core — A nine-module program introducing construction math, hand tools, power tools, construction drawings, basic safety, rigging and material handling, and employability and communication skills. 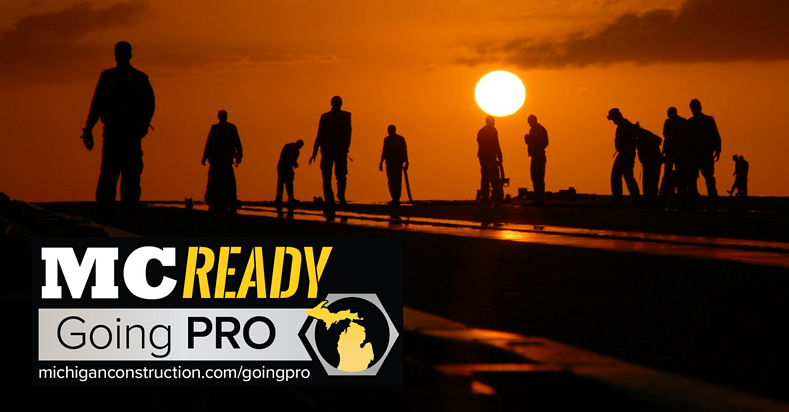 MC READY — An introduction to the basic pathways to construction careers specific to Michigan laws, regulations and industry practices. Specific instruction will include employability skills and trust building as well as components covering financial aid, modern day banking and pathways to CDL licensing. OSHA and CPR/First Aid training — Training by the Michigan Infrastructure & Transportation Association (MITA) in OSHA 10-Hour and American Red Cross CPR/First Aid. Following successful completion of this phase, participants will be eligible for a sponsored, paid, on-the-job learning experience that may be full- or part-time. Contact us should your company want to provide on-the-job experiences to MC READY participants. The three final components will include a two-day module providing a hands-on introduction to concrete conducted by the Michigan Concrete Association; a two-day heavy equipment operator experience at the AIS Heavy Equipment Training Institute; and a three-credit college course, DCMT 100: An Introduction to the Built Environment, at Lansing Community College. All MC READY Going PRO participants will be provided personal protective equipment, a transportation allowance, and a weekly stipend to attend NCCER Core and MC READY training. In addition, they will be eligible for a monetary award for successfully completing certain components. The program will begin in March and conclude in September with a hiring fair and graduation ceremony. This is a unique opportunity for motivated individuals to jump start their career. Read the full MC READY program description for further details. The Going PRO Apprenticeship Readiness initiative was established to expand and diversify Michigan Registered Apprenticeships, including the Michigan Advanced Technician Training (MAT2) Program. Michigan Construction, along with our many industry partners, is working to develop the next generation of the Michigan construction workforce and increase the number of skilled workers in Michigan. Click below to learn more and apply.